Virginia voter suppression tweets went undetected by Twitter for hours | No More Stolen Elections! A Twitter account misleading Democratic voters in Virginia by telling them they could cast their ballot by text message was active for almost three hours on Tuesday morning before Twitter suspended the account. 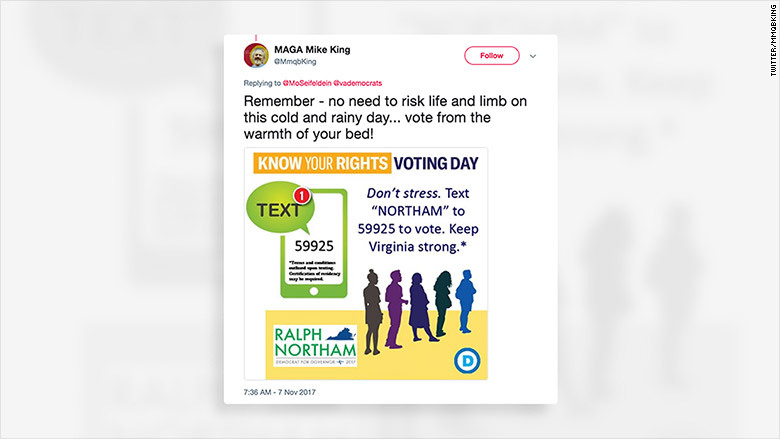 The account, "MAGA Mike King," was suspended after it tweeted more than a dozen times a graphic purportedly instructing Virginians on how to vote by text and including the logos of the Democratic Party and its gubernatorial candidate, Ralph Northam. The account doesn't appear to have had much success spreading its message, with less than a handful of interactions on each of the offending tweets, but to some observers that's almost beside the point. Their concern is that the account remained active for almost three hours out of the 13 hours that polls are open in Virginia, despite the fact that Twitter knows these sorts of efforts are a potential problem on its platform, and has claimed success in fighting back against them. A similar voter suppression campaign, which attempted to convince supporters of Hillary Clinton that they could vote for her by text, went viral ahead of last year's presidential election. At a Senate Intelligence Committee hearing on the role of social media in the 2016 election last week, Twitter touted its response to that voter suppression campaign as an example of how it works proactively to combat such efforts. Twitter said that it had deactivated 529 accounts that pushed the misinformation and that tweets refuting the "text-to-vote" campaign had eight times more impressions than the campaign itself. Tim Chambers, the founder of Discourse Intelligence, and co-founder of Dewey Digital, a consultancy firm that traditionally works with Democratic causes, reported the account "MAGA Mike King" account to Twitter at 9 a.m. Tuesday morning, more than an hour before it was taken down, he told CNN. "Ideally this would be something that Twitter would be catching very early and that it wouldn't take people like myself to spot and them reacting later," he said. "It certainly shows that Twitter needs to be more focused on pre-emptively going after this sort of disinformation as early as possible in the process," he added." Asked for comment, Twitter said it does not comment on specific accounts but said, "We are concerned about violations of our Terms of Service and U.S. law with respect to interference in the exercise of voting rights. When we become aware of such activity we take appropriate and timely action." Twitter would not provide any details on any additional resources it might have devoted to monitoring misinformation on Election Day, saying it didn't want to tip off the trolls. But about an hour after the "MAGA Mike King" account was suspended, Twitter tweeted from its government and election team's account, "Remember: you cannot vote via text or Tweet." On Tuesday afternoon, five hours after the tweet was sent, it had amassed only 44 retweets and 28 likes. A source familiar with Twitter's election monitoring told CNN on Tuesday afternoon that the company had several teams monitoring misinformation around the day's elections. The source said the company had not detected any other voter suppression efforts like the one from "MAGA Mike King," and suggested the issue appeared isolated. "MAGA Mike King" encouraged Virginians to vote by text using the same number that was pushed during the 2016 voter suppression effort. That number is operated by a California-based mobile marketing company, iVision Mobile. The firm responded to people who texted "Hillary" to the number last November with the message, "The ad you saw was not approved by iVisionMobile OR Hillary For America in any way." iVision Mobile told CNN on Tuesday that it would set up a similar message telling people who used the number on Tuesday that they were not actually casting a vote. "Unfortunately, there is little recourse for us to control unscrupulous characters from using our short code without consent," the company said. Correction: The original version of this article misstated the organization that Tim Chambers co-founded. It has been updated.